AP Request for change for Education Division in Gospadu and Kodumuru, Kurnool District as per Rc.No.120. AP School Education Dept. - Request for change for Education Division in Gospadu and Kodumuru, Kurnool District - Orders - Issued as per Rc.No.120/Estt-11/2018 Dated:17-07-2018. The District Educational Officer, Kurnool. Representatio, Dated.31-01-2018 of Sri Katti Narasimha Reddy, MLC, Kadapa, Ananthapur, Kurnool constituency. 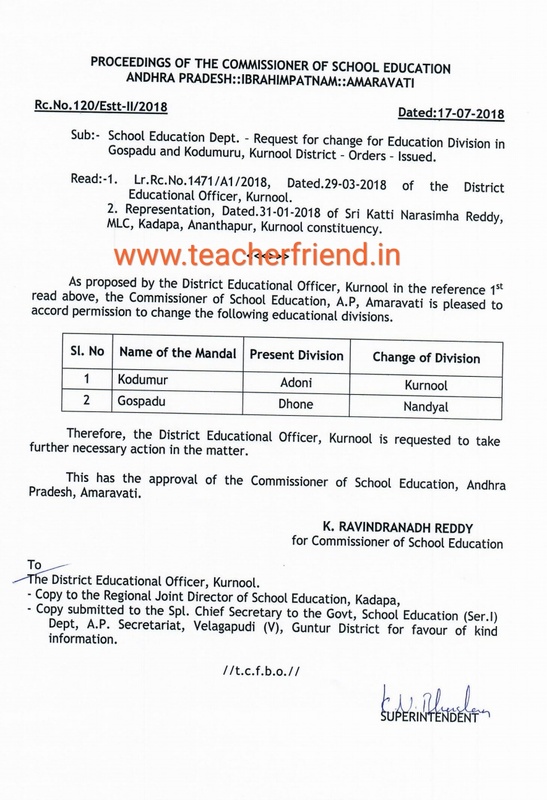 As proposed by the District Educational Officer, Kurnool in the reference 11t read above, the Commissioner of School Education, A.P, Amaravati is pleased to accord permission to change the following educational divisions. Therefore, the District Educational Officer, Kurnool is requested to take further necessary action in the matter.